Soothe your soul in the balmy waters of Mabibi Bay on the Elephant Coast of KwaZulu-Natal, at sublime Thonga Beach Lodge, set in tropical dune forest just metres from a pristine wilderness beach. It’s that secluded that giant turtles come here between November and February each year to birth their young. An exclusive experience of barefoot luxury includes snorkeling on a protected reef; diving with launches in front of the lodge; swimming with whale sharks, dolphins and manta rays; kayaking on Lake Sibaya; and seasonal turtle experiences. Spa treatments are another irresistible option, in between incomparably idyllic beach pleasures. 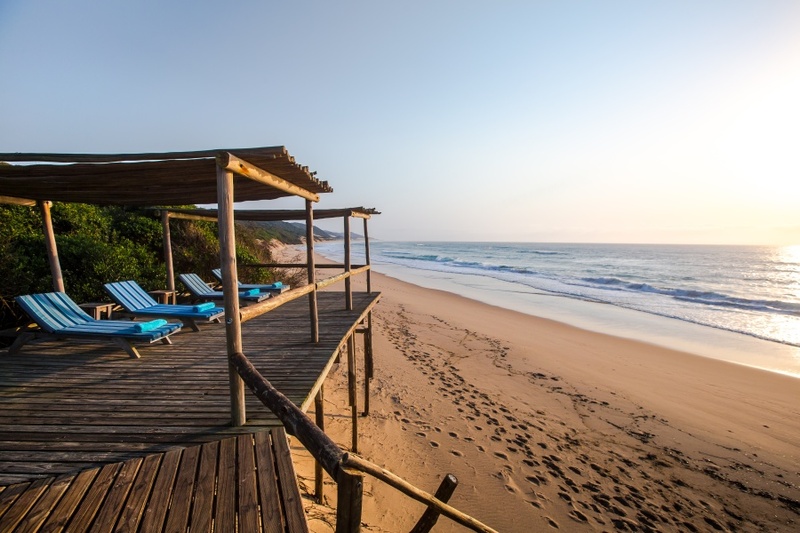 Thonga Beach Lodge forms part of the iSimangaliso Wetland Park World Heritage Site and is a dream come true for romantics, honeymooners and nature-ocean-and-beach worshippers. THONGA BEACH LODGE & LEOPARD MOUNTAIN LODGE COMBO WINTER WARMER 2019: Book 3 nights at each lodge and get 50% discount on the 3rd night. At Thonga the offer includes 3 nights accommodation in a Forest View Room, all meals, guided snorkeling, forest walks, kayaking, sundowner experience and village cultural tour, plus a bottle of sparkling wine, private dinner in a romantic setting and complimentary head and shoulder massage. At Leopard Mountain Lodge the offer includes 3 nights of accommodation, all meals, local drinks, private dining, 20% discount on spa treatments, 2 game drives per day and midday waterhole activity. Subject to availability and valid for travel during May and June 2019. PAY 3 STAY 4 SPECIAL OFFER 2018 / 2019: Spend 4 nights at Thonga and the 4th night is free, including meals and guided activities. Subject to availability and valid for travel in May and June in 2018 and 2019. SPRING SPECIAL 2019: Book 3 nights and get 50% off your 3rd night, subject to availability and valid for travel during September 2019. Thonga's rates include accommodation, all meals, guided snorkeling, forest walks, kayaking, sundowner experience and village cultural tour. Informal conferencing and teambuilding can be hosted for up to 24 people.